Successfully Added 4-Channel NVR Kit - 7-Inch Display, HD Cameras, IP67 Waterproof, SATA Support, WiFi, 15m Night Vision, App Support to your Shopping Cart. Protect your property at both day and night with this 4-channel HD NVR kit. This NVR kit comes with a total of 4 HD security cameras. Each camera features 6IR LED that treats you to 15m night vision. The NVR furthermore supports IR-Cut. Thanks to this, it will automatically switch to night vision filming whenever natural light is running low. 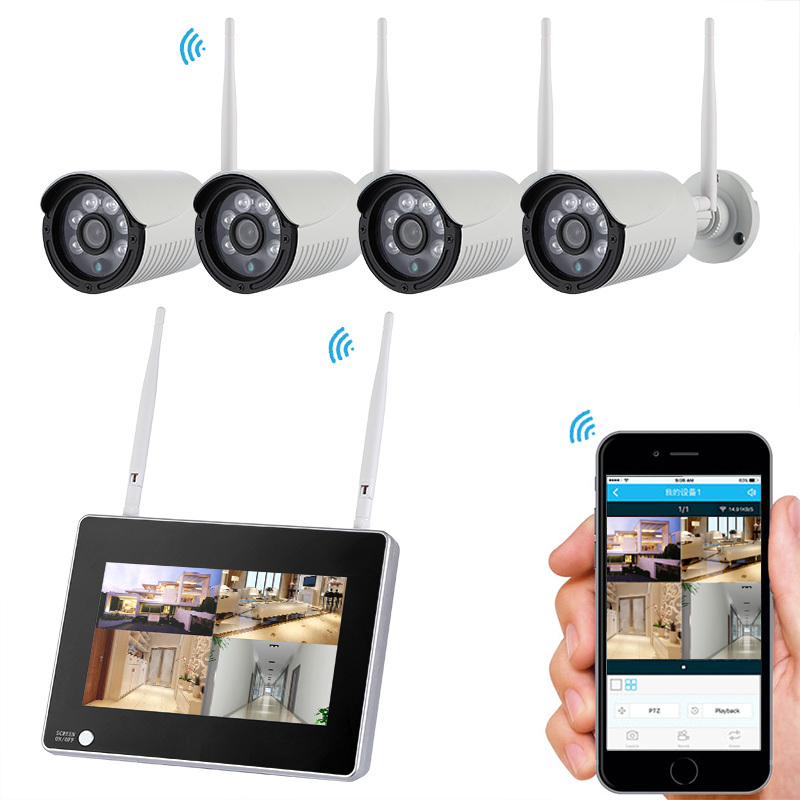 With these security cameras at your side, you can be assured that not a single unwanted person ever enters your property unseen again. Whether it’s day or night, from now on you’ll always be treated to HD resolution security footage. The IP cameras of this NVR kit feature a waterproof IP67 design. This makes them suitable for both indoor and outdoor usage. With their 1/4-Inch CMOS sensor, the NVR cameras produce crisp and detailed HD footage at any time of the day. Your IP cameras furthermore feature a 90-degree lens. Thanks to this, you can be assured that every corner of your property will be covered when using this NVR system. All recordings can be watched back instantly or later on at the included 7-Inch display. App support additionally lets you access your security system from afar. This NVR kit features a strong and stable internet connection that effortlessly transfers the recorded media from your cameras to your NVR system. This means that you no longer need to struggle with annoying internet cables in order to connect your IP cameras to your main device. Your security cameras support different recording modes to meet all your personal needs. It furthermore allows you to hook up a 4TB SATA drive to make sure there will always be enough storage to keep your recordings safe. This NVR kit comes with a 12 months warranty, brought to you by the leader in electronic devices as well as wholesale security gadgets..